We are lucky to have my mother living in the same metropolitan area as we live. 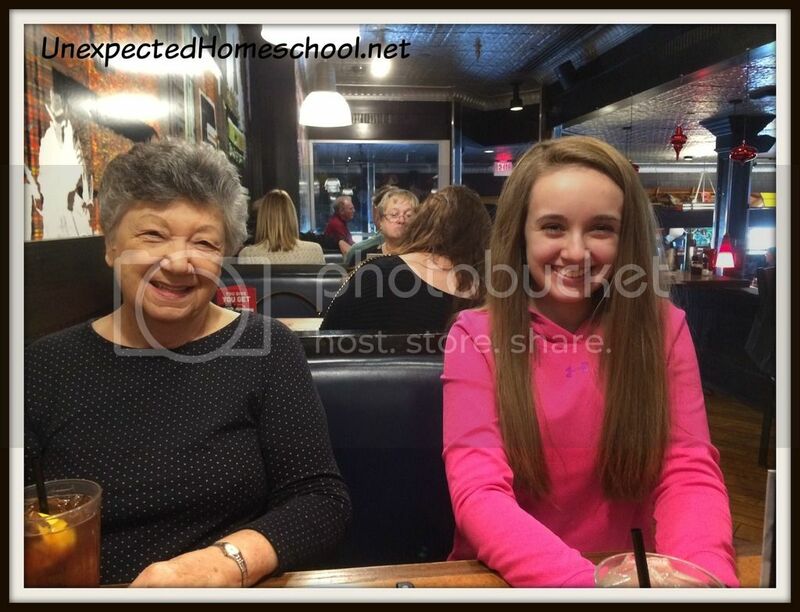 Amber loves to spend time with her grandmother and cherishes every moment. We don't have any set days we see her and sometimes go weeks without meeting up with my mom and then will turn around to see her three times in a week (like since my gall bladder surgery). Grandma is the go-to person when I need someone to stay with Amber. Even though Amber is nearly 14 years old, because of her medical conditions we do not feel comfortable leaving her alone for any length of time. Sometimes my mother simply meets up with us at a doctor's office or hospital and takes Amber to a nearby mall while I tend to my own appointment. On other days Amber will spend the time at Grandma's house playing games, cooking, and working on crafts. Then there are the days when we are out with appointments and call Grandma to meet us for a spur of the moment lunch. It is a great privilege to have my mom so geographically close to us and we truly enjoy spending time with her. Amber looks forward to December every year since it means we will celebrate Grandma's birthday and have a Christmas cookie baking day too. Amber can't spend enough time with her grandmother, it seems. It makes my heart happy to see the relationship Amber has with my mother. She was the best mother one could ever hope to have and now is the best of grandmothers too. My son has a great relationship with his gramma on my husbands' side as well. It is such a joy to us. :) Visiting from alphabet blogging. What a lovely post. My mother lives just one mile away from me. I am so blessed. You are so fortunate to have her close. We live in a large metro area and my mom is roughly a half an hour drive from us. We even have to cross the Missouri River to get to her home. Thankfully Mom lives close to or on the way to most of the hospitals or medical locations we use, so it's easy to see her those days. My mom and mother in law live less than 10 minutes from me! I am so blessed that my kids have close relationships with both. What a special blessing to have family so close by. All of our relatives are a long ways from here, but they've always been there for me when I needed them. My dad came from Georgia to Arizona to take care of me and my children after I had kidney surgery a few years ago (while my husband was deployed).